Ernst's Economy for you: DBA Law Wars: The Internal Revenue Service strikes back! DBA Law Wars: The Internal Revenue Service strikes back! ... there was a lot of confusion about a law that was aimed at protecting the “not-so-freelancers” in The Netherlands from unscrupulous principals: companies and people, who were exploiting these freelancers in order to let them do their work against remunerations that are well below the market value/standards of their labour. Or building pits, factories and agricultural farms where Bulgarian and Romanian people, as well as Dutch workers with formerly a fixed contract, worked under sometimes humiliating circumstances, squeezed out by unconscionable companies and frugal bosses-without-a-heart! In order to fight this disturbing phenomenon, the Dutch Minister for Social Affairs Lodewijk Asscher (Labour Party) and the Dutch State Secretary for Tax Affairs Eric Wiebes (liberal-conservative VVD party) – the first official responsible for the Dutch Internal Revenue Service (i.e. 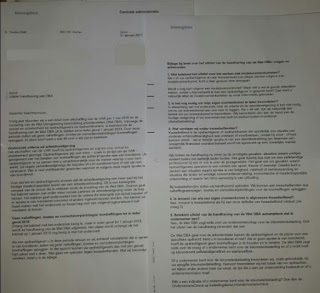 Belastingdienst in Dutch) – joint forces and constructed the DBA Law (i.e. Law for Deregulation regarding the Assessment of Labour Relations). This law was aimed at maintaining the freelance status – and the accompanying fiscal perks – for real freelancers, but forcing employers and principals to take not really independent freelancers under a labour contract again. To the eyes of Wiebes and Asscher this new approach should yield a win-win situation: real freelancers would get in a stronger, legal position and "bogus self-employeds" would get back in a fixed contract (under a social security umbrella) again. What could go wrong?! But of course the opposite happened: not only the jobs of the (possibly) exploited "not-so-freelancers" vanished without a trace, in exchange for something even more unfavourable, like zero-hour contracts, payrolling and other artificial, legal constructions that should shield the large principals against legal actions by the IRS. Also the typical temporary jobs and assignments for smart and highly-educated freelancers, like ICT-oriented jobs, commercial services jobs, legal jobs and temporary civil service jobs vanished in many, many cases. There were probably close to half a million of such highly-educated freelancers and these were people who absolutely did not have to be protected by this Law of Good Intentions and Poor Results. When not all these conditions are met in a freelance model contract, the Dutch IRS considers the freelance working relation to be a ‘common labour relation in disguise’, which is due for tax and social security payments by the principal (aka the temporary employer). All this was simply too much for many employers and principals and they just ditched their freelancers, leading to massive extra unemployment among these freelancers. 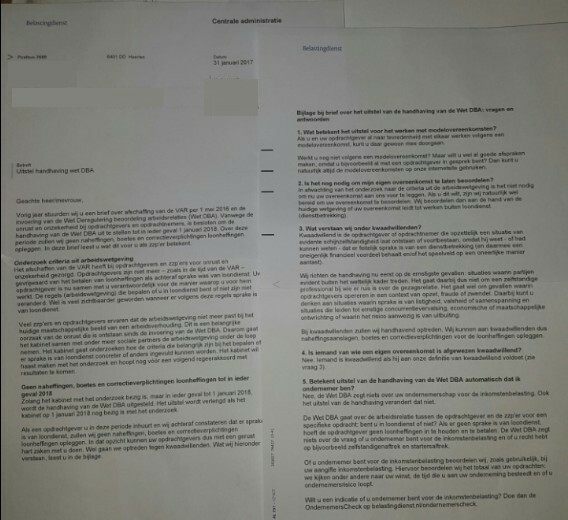 And to be fair, during the last two months and in spite of my warnings in the aforementioned snippets, there were some (very) cautious signals that companies started to hire a few freelancers again: particularly ING Bank was mentioned by a freelance friend of mine to this respect. It seemed these companies were slightly reassured by the soothing words of the State Secretary Eric Wiebes that the Internal Revenue Service would maintain reasonable standards for identifying "fake freelancers" and would not uphold this law before January 2018:“Everything would come up roses”. This was probably not to the liking of the Internal Revenue Service, who had been brooding upon a letter ever since, in which they wanted to explain what they would see as “malevolent principals and fake freelancers”. 3. What do we mean with ‘malevolents’? Malevolent is the principal or contractor who deliberately lets a situation of evident fake self-employedness emerge or persist, as he knows – or could have known – that there is actually a ‘common employment in disguise' situation [instead of a genuine freelance situation – EL] (from which he gains a financial advantage or which damages the level playing field in an unjust, unfair way). At first we aim our efforts at the most serious cases: cases in which parties evidently [and deliberately – EL] exceed the legal boundaries. This is definitely not a freelance professional with whom there is some opaqueness regarding the authority relation between him and his principal. No, this is about cases in which principals operate in a context of bad intentions, fraud or deceit. Here you can think about situations in which a certain amount of shrewdness, illegitimacy or conspiracy is present and in situations that lead to serious violations of the level playing field, economic or societal spraining or in which a lively risk of exploitation exists. In case of malevolents we will take law-enforcing actions. In this case we can administer to such malevolents: after-taxes, penalties and mandatory corrections regarding the wage and income taxes. 4. Is someone of whom a ‘model agreement’ is rejected [by the IRS - EL]by definition malevolent? 5. Does postponement of law-enforcement regarding the DBA law [in my individual case] automatically mean that I am an entrepreneur? No, the DBA Law does not say anything about your entrepreneurship with respect to the income taxes. Nothing has changed as a consequence of the postponement of law enforcement regarding this law. The DBA Law regards the labour relation between the principal and the freelancer for a particular assignment: are you actually in a common labour relation or not?! When there is not actually a common labour relation, the principal does not have to withdraw wage taxes and social security charges and pay this [to the IRS and other executive organizations– EL]. However, the DBA Law does not say anything about the questions whether you are an entrepreneur or not for the income taxes and whether you are entitled for independent workers’ and starters’ tax deductions or not. Whether you are an entrepreneur or not is at our judgment, as usual, during the process of assessing your income tax statement. For this we assess the total of your assignments: we look at your profits, the time that you spent on your enterprise and whether you run entrepreneurial risk. Well, is that clear? Or is that clear?! All questions were answered in one crystalclear and concise letter from the IRS, in plain bread-and-butter Dutch, that everybody could easily understand. I assure you that it was a helluva job to translate these snippets and probably I even made a mess of it, to the eyes of official translators. Who EXACTLY is a genuine malevolent principal or contractor of the worst kind, according to this definition, that can meet law enforcement actions early in 2018? What will happen to the so-called borderline cases, which are probably malevolent, but not so obvious as in the worst cases? What will happen to them later in 2018 or 2019? And what will happen to principals and contractors in much more opaque situations between benevolence and malevolence, like the aforementioned "unclear authority relation between the principal and the contractor", when the most obvious cases (aka bullet 1 and 2) are out of the way, somewhere in 2018/2019? And last, but not least, why is it so darn hard to administer one exact definition of freelance entrepreneurship, borne by both the IRS and the State Secretary of Tax Affairs, that does not give half a million freelancers and numerous large and small principals the willies?! A definition that also works as a definition for entrepreneurship (see question 5) with respect to the annual income tax statement? Especially State Secretary for Tax Affairs Eric Wiebes – who is already in the crosshairs of the opposition in the Second Chamber of Parliament for quite some time – must now suffer for the fact that he preserved this terrible and extremely poorly designed law, in spite of the ubiquitous protests and negative side-effects that emerged during 2016. And also for the fact that he did litterally nothing to narrow the room for interpretation of this law between his Department of Finance and Tax Affairs and the Internal Revenue Service, else than kicking the can down the road and telling the Dutch companies and people they could rest assured until 2018. Again the sh*t is hitting the fan for the umpteenth time, with respect to this extremely sensitive subject. And again it seems that the Dutch IRS does anything to shed an unfavourable light upon this hopelessly weak State Secretary for Tax Affairs Eric Wiebes –seemingly to tackle him before the end of this cabinet period – by administering unclear and extremely complex statements, that nevertheless totally seem to counter earlier statements made by Eric Wiebes! At this moment I am extremely glad that I am not a freelance professional myself anymore. In which country The Netherlands do I live? !